As is the tradition with movies that are promoted like mad, most of them turn out to be far below expectations. And so it is with Ra.One. If you have taste, and watch a lot of good movies, and appreciate the calibre of actors like Shah Rukh and Kareena, then Ra.One will come as a terrible disappointment - to be aptly summarised in the words of the irritating boy character Prateek - Oh fish! Don't forget 100 gms of robot-learning-antics from the classic "The Bicentennial man"
Cook to a charcoal-black, and let the smell spread for many months before you serve. Enjoy patrons. Thanks for buying the tickets, and paying extra for the 3-D glasses. As the movie starts, a bumbling Shah Rukh Khan (a south Indian character, poorly played) tries to park his car, and throw the keys to a friend (valet? ), doing both with amazing errors. Quite surprising for a genius who ends up creating artificial reality that even the Wachowski brothers were scared to bring forth so quick in their creations. So this genius video-game programmer has a kid who does not believe his father is a cool dude (pronounced 'dood' idiot, not 'dude'). The father tries instilling some good south Indian family values in the kid, but the producer unfortunately neither gives enough time in the movie for some good moments to depict that, nor is the Director too worried that a thin treatment of the core message of the movie will dilute the whole game. That's what happens. The movie loses all track soon, and the storyline vanishes like Kareena's grief soon after her husband's sudden death. A song with words like "Mohan" appears out of the blue when a nattily dressed dead Shah Rukh Khan is ensconsed in his coffin, for everyone to see. The song is out of the place, the death is strangely executed, the whole sequence is terribly done. Things move rather fast. 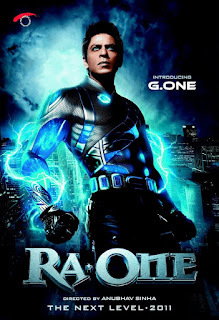 The villain - Ra.One - is a powerful one because the father needs to oblige the son by creating a really strong villain because that's what the son longs for (although plays for the Hero, and that too strangely with a black name - "Lucifer"). So he creates Ra.One. And in the launch party, the son quietly plays away while father is busy dancing and singing to some utterly stupid Hindi number in the heart of America (with majority of non-Indian Americans around). And the oriental mother of the father's colleague ensures her distaste for Jackie Chan is properly displayed (why, oh why!). So the son leaves the game midway near the end of the second round, and Ra.One comes alive. "How dare you leave me thus?" (The anger is quite understandable, given the budgets and all). Ra.One fantastically crosses the border from virtual to real, by invoking all available and willing electrons in the lab, and starts doing pretty nasty things. But lose no heart! The hero - G.One (or Jeevan, in Hindi) was also made by the father Shah Rukh Khan when alive, although a much weaker one (because Prateek wanted it so). So through some electronic tomfoolery the glamorous techincal assistant of the now-dead father brings G.One back to life. And then G.One starts rocking, from America to India. Then, as we just said, follows a great journey from America to India, once the father is killed, mother moves back home to an assorted menagerie of airport goondas (unbelievably lame sequence! ), Mumbai local driver's coach (eeks! ), a fat south Indian neighbour, and some more attempts at holding the masala loving Indian audience. Unfortunately when you create a film based on a Sci-Fi film, it inevitably degenerates into an emotion packed trashcan that has everything in it but genuine science fiction. G.One jumping around the Mumbai local could have been done much better, at least. Why do Indian science fiction movies resort to crutches of comedy repeatedly? Does the Director completely lack confidence in a pure sci-fi sequence? I particularly find it rather tiresome when characters are artificially inserted to try to make you laugh through their out-of-place physical antics that have no sense in a setting like the one. Satish Shah wasted. Finally, after all the mumbo-jumbo and heavy animations are shown from all angles, and the animation studios have earned their fees, comes the final showdown. A shadow is all it takes, fantastic. And Arjun Rampal (oops, Ra-One) is tamed. If this movie is for kids, you are doing a bad job because they will learn that this is what science fiction is. A very bad idea. If it is for adults, then please give it a mature treatment. The idea was not bad - you just cooked it charcoal black, and had nothing truly original in the tactics, or the storyline treatment. A lot of effort - all gone down the drain. After all these years, I am still waiting for a genuine Hindi science fiction movie. Come on Bollywood, trust the audience. We deserve much better. And don't try to convince me this was an action movie - that would be a grand excuse. I wasted a complete Sunday evening for this? Oh fish! Ra. One could have been better, had they made with a single minded approach, the Director and the Producer tried to woo both genre (kids and adults) and here is a blunder. Thanks for sharing the detailed and authentic review of RA.1. 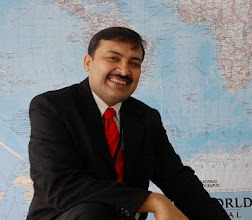 It really help others to save their money, moreover it helps in escaping from 2-3 hours of torture. Ha ha ha ha ha... fantastic analysis... the title is rip-roaring OH FISH !! !